The GRAVI3 concept consists on a mixed concrete-steel self-buoyant GBS made by three concrete caissons supporting a steel tripod. Design is suitable for deep water locations. It has been evaluated for depths between 35m and 60m, with WTG up to 8 MW. An operational environment as Aguçadoura (in the North coast of Portugal) and its local conditions has been chosen at time of doing all the calculations as well as, for establishing construction procedure. These conditions are representative of European Coast. The main aspect of this solution is that it tries to minimize the use of HLV during all phases of project's deployment. 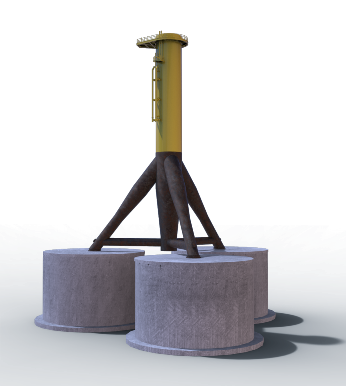 The concrete caissons are built using slip-forming systems inshore (floating docks with high construction rates) and, therefore, there are no special needs for onshore construction yard, minimizing use of port area for construction and storage. This three legged concept provides the following advantages: multi-hull design for naval stability and navigation and a better support allowing WTG transportation, improved behaviour of structure against overturning, and maximized contact area to minimize load transmitted to soil. Transportation shall be made by towing with normal tugs. After installation is done, no solid ballast is needed as only filling with water the caissons shall suffice.